WASHINGTON — Sen. John McCain, days after being diagnosed with an aggressive form of brain cancer, is expected to take up the 2018 defense policy bill after he returns to the Senate on Tuesday. McCain’s office announced Monday night that he planned to return to cast a critical vote on health care legislation. Also Monday night, Senate Majority Leader Mitch McConnell, R-Ky., teed up consideration of the National Defense Authorization Act. 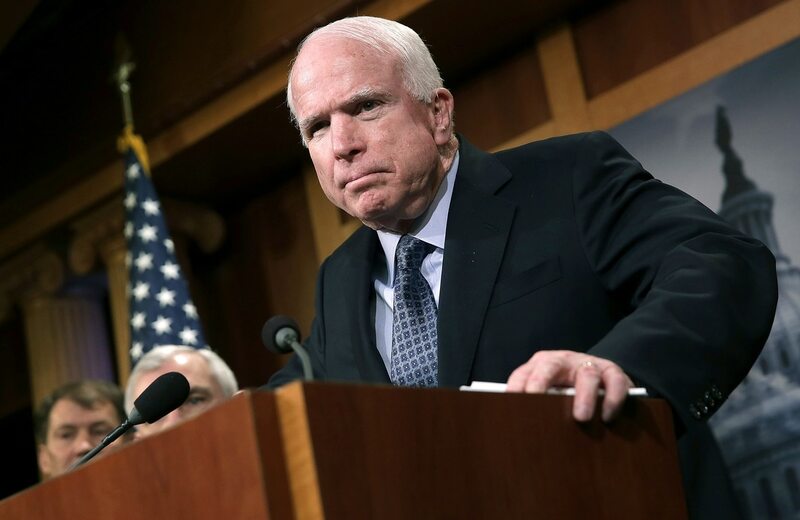 “Senator McCain looks forward to returning to the United States Senate tomorrow to continue working on important legislation, including health care reform, the National Defense Authorization Act, and new sanctions on Russia, Iran and North Korea,” his office said in a statement. On Monday evening, McConnell laid out a procedural vote to move forward on the NDAA. He did not say what business the Senate would proceed to when it convenes at noon on Tuesday. To revamp the Affordable Care Act, McConnell needs at least 50 votes to proceed to the bill. With several senators in the 52-member conference wavering, McConnell needs all the votes he can get. McCain, R-Ariz., as chairman of the Senate Armed Services Committee, is expected to manage the bill on the Senate floor. Oklahoma Republican Sen. Jim Inhofe, a senior member of the SASC, has been chairing the panel in McCain’s absence.